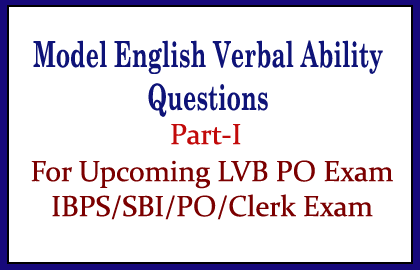 Candidates those who are preparing for the upcoming Lakshmi Vilas Bank PO Exam and all other banking exams such as IBPS/PO/Clerk exam can use the below English Ability practice Questions. Directions (Q. 151-160): In the following passage there are blanks, each of which has been numbered. These numbers are printed below the passage and against each, five words/phrases are suggested, one of it fits the blank appropriately. Find out the correct word/phrase and fill in the blank. Information technology, and the hardware and software (1) with the IT industry, are an (2) part of nearly (3) major global industry. IT industry has become one of the most robust industry in the world. IT, more than any other industry or economic (4) , has an increased productivity, particularly in the development world, and therefore is a key driver of global economic growth. Economics of scale and (5) demand from bothconsumers and enterprises (6) this rapidly growing sector. The Information Technology Association of America (ITAA) explains ‘information technology’ as (7) all possible aspects of information systems based on computers. Both software development and the hardware involved in the IT industry include everything from computer systems, to the design, implementation, study and development of IT and Management systems. (8) toits easy accessibility and the wide range of IT products available, the demand for IT services has increased (9) over the years. To IT sector has emerged as a major global (10) of both growth and employment.